A cross platform isometric game engine that helps you to convert your game vision to reality with feature rich easy to use built in game development framework. 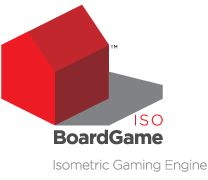 Co-developed by [x]cube GAMES, ISO BoardGame is a cross-platform isometric game engine that enables easy development of successful social-simulation games on both iOS and Android platforms. This feature-rich, built-in game development framework makes it easy to transform your game vision into a reality by making it easy for you to gain control over the map structure, customize tile size and aspect ratio, handle backgrounds and foregrounds and control gameplay view by panning, zooming and scrolling. Moreover, ISO BoardGame also enables Avatar movements and actions, allows run-time editing of maps, and provides user interface creation tools and much more to bring life to your characters and to make gaming a breeze. Have a game to be designed? Development of Farm/Crops mechanism with different time-bound states like plow, harvest and wither etc. in farming based games. Cooking mechanism in Dining based games with various time-bound stages like cooking, ready to serve, and damaged etc. Table-Chair bonding mechanism in Dining games where the avatar walks into diner, sits on the chair, dish will be ready on the table, and he eats and leaves the diner. Decor Bonus mechanism is available where user can get the bonus value from the game. In-game collection items mechanism is handled. Block based and L-shaped expansion is handled. Twitter and Facebook integration. Audio & music integration. Sending and receiving gifts mechanism. Announcements like offers, discounts etc., can be displayed. Assets can be downloaded from server. Send and receive messages in between users. Manage the game sessions in the server. Game sessions can be synced with Facebook or GameCenter to enable access on multiple devices. And, allowing you to get complete control over your game, add more power to it and create an army of passionate users.